^ 1.0 1.1 한국계 호주대표 임다미, 유로비전 송 콘테스트 아쉬운 2위. 연합뉴스. 2016-05-15 [2016-05-17] （韩语）. ^ 2.0 2.1 Moran, Jonathan. The X Factor favourite Dami Im was bullied at school. The Daily Telegraph. 2013-08-30 [2016-05-17]. ^ Wass, Mike. Dami Im's 'Living Dangerously' Is Another Gorgeous Pop Anthem: Listen to the 'Heart Beats' Buzz Track. Idolator. SpinMedia. 2014-10-09 [2016-05-17]. ^ X FACTOR冠军任多美不插电音乐会 激情唱响沪上. 搜狐娱乐. 2014-10-29 [2016-05-17]. ^ 欧洲歌唱大赛乌克兰夺冠 澳俄分居二三. TVBS. 2016-05-16 [2016-05-17]. ^ 欧洲歌唱大赛全球瞩目中落幕 乌克兰女歌手夺魁. 中国新闻网. 2016-05-16 [2016-05-17]. ^ 7.0 7.1 7.2 7.3 Vincent, Peter. X-Factor's Dami Im set to be first Asian-Australian pop star. The Sydney Morning Herald (Fairfax Media). 29 September 2013 [2016-05-17]. （原始内容存档于2013-10-24）. ^ Australia: Dami Im will fly the flag for Australia - ESCDaily.com -- The latest Eurovision 2016 news from across Europe and Australia. ESCDaily.com -- The latest Eurovision 2016 news from across Europe and Australia. ^ 9.0 9.1 9.2 9.3 About Dami Im. Eurovision.tv. [2016-05-17]. ^ Birthday in the studio. Twitter. 17 October 2013 [29 October 2013]. ^ Busy birthday. Twitter. 18 October 2013 [29 October 2013]. ^ 'The X Factor' Victor Dami Im: 'I Will Become A Singer That Brings Hope'. Kpopstarz. 2014-05-09 [2016-05-18]. ^ Eurovision 2016: Dami’s Army Man. SBS. 2016-05-13. ^ 14.0 14.1 14.2 14.3 14.4 14.5 14.6 The secret life of Dami Im. Women's Weekly. 2016-05-16. ^ 15.0 15.1 15.2 15.3 15.4 Dami Im: Finding My Family (Part One). Sunday Night. Yahoo!7. 25 May 2014 [26 May 2014]. ^ 16.0 16.1 16.2 16.3 16.4 Finalists – Dami Im. The X Factor Australia. Yahoo!7. [2016-05-17]. （原始内容存档于2013-10-23）. ^ 17.0 17.1 Sams, Christine. 'Some people thought I was stupid': X Factor star Dami recalls terrible childhood. The Age (Fairfax Media). 29 August 2013 [2016-05-17]. （原始内容存档于2013-10-23）. ^ Dami Im. The Lev Vlassenko Piano Competition. [2016-05-17]. （原始内容存档于2013-10-23）. ^ Bochenski, Natalie. X-Factor's Dami Im Gains Support From Former School. Brisbane Times (Fairfax Digital). 3 September 2013 [2016-05-17]. （原始内容存档于2013-10-23）. ^ Bochenski, Natalie. Dami Im returns to former school John Paul College. The Sydney Morning Herald (Fairfax Media). 23 October 2013 [2016-05-17]. （原始内容存档于2013-10-24）. ^ UQ Alumni Dami Im: X Factor. University of Queensland. [2016-05-17]. （原始内容存档于2013-10-23）. ^ 22.0 22.1 22.2 Neil, Alicia. Life After the X Factor. Who Magazine (Pacific Magazines). 2 December 2013: 40–42. ^ Adams, Cameron. X Factor reveals final Top 12 to perform at live shows. The Daily Telegraph (News Limited). 21 August 2013 [22 August 2013]. ^ 24.0 24.1 24.2 Bochenski, Natalie. Holy spirit behind Dami Im's angelic voice. Brisbane Times (Fairfax Digital). 9 September 2013 [2016-05-17]. （原始内容存档于2013-10-23）. ^ Dami 1st Story – Dream. Bugs!. 20 July 2011 [30 October 2013]. ^ My Christmas Album event!. Facebook. 9 December 2011 [27 October 2013]. ^ Dami Christmas Story. Bugs!. 5 December 2011 [30 October 2013]. ^ Intimacy (친밀함). Bugs!. 9 July 2012 [30 October 2013]. ^ The X Factor Australia Premiere Recap – Is Jai Waetford The Next Justin Bieber?. Take 40 Australia. MCM Entertainment. 29 July 2013 [23 October 2013]. （原始内容存档于2013-10-29）. ^ 30.0 30.1 The X Factor Australia Bootcamp Recap – Jai Waetford Forgets His Words, But Still Makes It Through!. Take 40 Australia. MCM Entertainment. 12 August 2013 [23 October 2013]. （原始内容存档于2014-10-09）. ^ The X Factor Australia Bootcamp Recap – Jiordan Tolli Stuns With Kate Bush's Running Up That Hill. Take 40 Australia. MCM Entertainment. 13 August 2013 [23 August 2013]. （原始内容存档于2014-10-08）. ^ The X Factor Australia Recap – Dami Im Returns As Matt Gresham Pulls Out of the Competition!. Take 40 Australia. MCM Entertainment. 19 August 2013 [23 October 2013]. （原始内容存档于2014-07-26）. ^ The X Factor Australia Recap – Jai Waetford Makes It Through As Georgina Mastin and Riv Are Sent Home!. Take 40 Australia. MCM Entertainment. 20 August 2013 [23 August 2013]. （原始内容存档于2013-08-24）. ^ Hardie, Giles. The X Factor recap: Adira–Belle the first finalists sent home. The Sydney Morning Herald (Fairfax Media). 26 August 2013 [23 October 2013]. ^ 35.0 35.1 35.2 35.3 35.4 35.5 35.6 Hung, Steffen. Discography Dami Im. Australian Charts Portal. Hung Medien. [30 October 2013]. ^ The X Factor Australia Live Shows – Dami Im Does It Again With Prince's Purple Rain. Take 40 Australia. MCM Entertainment. 1 September 2013 [23 October 2013]. （原始内容存档于2013-10-19）. ^ The X Factor Australia Live Show – Dami Im Steals the Show Once Again with a Disco Track!. Take 40 Australia. MCM Entertainment. 8 September 2013 [23 October 2013]. （原始内容存档于2015-01-04）. ^ Ryan, Gavin. ARIA Singles: Redfoo Is Number One. Noise11. Noise Network. 14 September 2013 [14 September 2013]. ^ The X Factor Australia Live Shows – Dami Im Smashes Katy Perry's Roar!. Take 40 Australia. MCM Entertainment. 15 September 2013 [23 October 2013]. （原始内容存档于2015-01-11）. ^ B, Alicia. The Top 8 Rock X Factor!. Throng (Throng Media). 22 September 2013 [23 October 2013]. ^ Ryan, Gavin. ARIA Singles: Katy Perry Roar Spends 5th Week at No. 1. Noise11. Noise Network. 28 September 2013 [28 September 2013]. ^ Hardie, Giles. Minogue reduced to tears on X Factor. The Sydney Morning Herald (Fairfax Media). 29 September 2013 [23 October 2013]. ^ Hardie, Giles. X Factor recap: Omar gets an obituary. The Sydney Morning Herald (Fairfax Media). 8 October 2013 [23 October 2013]. ^ Ryan, Gavin. ARIA Singles: Katy Perry Is Still Roaring. Noise11. Noise Network. 12 October 2013 [12 October 2013]. ^ B, Alicia. The X Factor Top 5 Do Aussie Song Week. Throng. Throng Media. 13 October 2013 [23 October 2013]. ^ The X Factor Australia Live Show – Dami Im Takes on Miley Cyrus' Wrecking Ball. Take 40 Australia. MCM Entertainment. 20 October 2013 [2016-05-17]. （原始内容存档于2013-10-23）. ^ Ryan, Gavin. ARIA Singles: It Is Still About Katy Perry. Noise11. Noise Network. 26 October 2013 [26 October 2013]. ^ The X Factor Live Final – Dami Im Steals the Show with And I'm Telling You!. Take 40 Australia. MCM Entertainment. 27 October 2013 [27 October 2013]. （原始内容存档于2013-10-28）. ^ Vincent, Peter. X Factor winner Dami Im tops ARIA chart with Alive. The Sydney Morning Herald (Fairfax Media). 2 November 2013 [2 November 2013]. ^ 50.0 50.1 Hardie, Giles. Taylor Henderson forgets words in X Factor clanger. The Sydney Morning Herald (Fairfax Media). 28 October 2013 [2 November 2013]. ^ Ryan, Gavin. ARIA Singles: Dami Im Is Alive at Number One. Noise11. Noise Network. 2 November 2013 [4 November 2013]. ^ Byrnes, Holly. X Factor Australia Grand Final: Dami Im completes demolition with army. Herald Sun (The Herald and Weekly Times). 28 October 2013 [28 October 2013]. ^ Alive – Single by Dami Im. iTunes Store (Australia). Apple. [28 October 2013]. ^ Dami Im Wins The X Factor!. The X Factor Australia. Yahoo!7. 28 October 2013 [29 October 2013]. （原始内容存档于2013-10-31）. ^ ARIA Charts – Accreditations – 2013 Singles. Australian Recording Industry Association. [5 February 2014]. ^ CD – Dami Im (Album). Sanity. [29 October 2013]. ^ 57.0 57.1 Vincent, Peter. Dami Im makes X-Factor ARIA Charts history. The Sydney Morning Herald (Fairfax Media). 23 November 2013 [23 November 2013]. ^ ARIA Charts – Accreditations – 2013 Albums. Australian Recording Industry Association. [5 February 2014]. ^ 59.0 59.1 The X Factor Live Tour 2013. The X Factor Australia. Yahoo!7. [2016-05-17]. （原始内容存档于2013-10-23）. ^ The X Factor winner, Dami Im, partners with Compassion Australia. Compassion Australia. 23 December 2013 [2016-05-17]. ^ I Am Australian (feat. John Foreman) – Single by Various Artists. iTunes Store (Australia). Apple. [25 January 2014]. ^ Sony Music Artists To Release 'I Am Australian' In Time For Australia Day. Spotlight Report. 25 January 2014 [2 February 2014]. ^ Ryan, Gavin. ARIA Singles: Pharrell Williams Is Still Happy On Top. Noise11. Noise Network. 1 February 2014 [1 February 2014]. ^ Jolene (Acoustic) – Single by Dami Im. iTunes Store (Australia). Apple. [7 March 2014]. ^ Dami Im at ABU Television Song Contest. SBS. 2014-10-17 [2016-05-18]. ^ Heart Beats (Deluxe Edition) by Dami Im. iTunes Store (Australia). Apple. [26 September 2014]. ^ Gaon International Download Chart – Issue date: 14.05.18 – 14.05.24. Gaon Chart. [30 September 2014]. （原始内容存档于2014-10-06）. ^ Gaon International Digital Chart – Issue date: 14.05.18 – 14.05.24. Gaon Chart. [30 September 2014]. （原始内容存档于2014-10-06）. ^ ARIA Charts – Accreditations – 2014 Singles. Australian Recording Industry Association. [17 October 2014]. ^ 70.0 70.1 Venardos, Victoria. News: John Legend Announces Australian Tour. Renowned for Sound. 20 October 2014 [20 October 2014]. ^ Smile – Single by Dami Im. iTunes Store (Australia). Apple. [24 April 2015]. ^ Ryan, Gavin. ARIA Singles: Taylor Swift Bad Blood Spends Second Week At No. 1. Noise11. 6 June 2015 [6 June 2015]. ^ X Factor winner Dami Im to represent Australia at 2016 Eurovision song contest. The Guardian. 2016-03-03 [2016-05-17]. ^ Eurovision Song Contest 2016 Second Semi-Final. Eurovision.tv. ^ Eurovision Song Contest 2016 Grand Final. Eurovision.tv. ^ Eurovision 2016: Dami Im second for Australia as Ukraine wins. The Australian. 2016-05-15 [2016-05-17]. ^ She's still the talk of Europe, but Dami Im is at risk of wasting her golden Eurovision opportunity. News.com.au. 2016-05-16 [2016-05-18]. ^ Dami Im has no plans for immediate European tour. News.com.au. 2016-05-16 [2016-05-18]. ^ DAMI IM COVERS CARPENTERS. www.auspOp.com.au. 4 March 2016 [4 March 2016]. ^ 'The X Factor' Victor Dami Im 'I Will Become A Singer That Brings Hope'. KpopStarz. 9 May 2014 [2016-05-17]. （原始内容存档于2014-05-20）. ^ Heart Beats (CD). 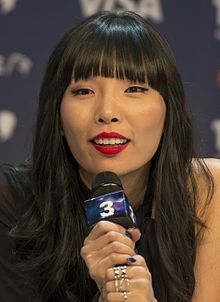 Dami Im. Sony Music Entertainment Australia. 2014. ^ Crane, Kris. Husband is X-Factor star Dami Im's biggest fan. Herald Sun (The Herald and Weekly Times). 24 October 2013 [2016-05-17]. （原始内容存档于2013-10-24）. ^ Dami Im: A cultural ambassador with the X Factor. The Sydney Morning Herald (Fairfax Media). 29 October 2013 [2016-05-17]. （原始内容存档于2013-11-02）. ^ Daniels, Kelly. Dami just like us. The Logan Reporter (APN News & Media). 4 December 2013. ^ DAMI IM ‘YESTERDAY ONCE MORE’ CLASSIC CARPENTERS TOUR DATES AND TICKETING INFORMATION. Yahoo. 2016-04-22. ^ Nova's Red Room Global Tour intimate shows seen by the world. The Daily Telegraph (News Limited). 4 September 2014 [4 September 2014]. ^ Manser, Robert. Poprepublic.tv Awards Nominations Announced. Poprepublic.tv. AKA Entertainment. 25 January 2014 [2016-05-17]. （原始内容存档于2014-01-27）. ^ 88.0 88.1 Cashmere, Paul. ARIA Launches Number One Chart Award. Noise11. Noise Network. 26 May 2014 [26 May 2014]. ^ Nomination for World's Best Female Artist. World Music Awards. [2016-05-17]. （原始内容存档于2014-02-25）. ^ Nomination for World's Live Act. World Music Awards. [2016-05-17]. （原始内容存档于2014-02-25）. ^ Nomination for World's Best Entertainer of the Year. World Music Awards. [2016-05-17]. （原始内容存档于2014-02-25）. ^ Nomination for World's Best Song. World Music Awards. [2016-05-17]. （原始内容存档于2014-02-25）. ^ 93.0 93.1 Stephenson, Alison. Lisa Wilkinson speaks about the 'F-word' at the Cosmopolitan Fun, Fearless, Female Awards. News.com.au (News Limited). 12 November 2014 [13 November 2014]. ^ Oz Artist of the Year 2014 Wildcard. Channel V Australia. 14 September 2014 [2016-05-17]. （原始内容存档于2014-09-14）. This page is based on the Wikipedia article 林多玫; it is used under the Creative Commons Attribution-ShareAlike 3.0 Unported License (CC-BY-SA). You may redistribute it, verbatim or modified, providing that you comply with the terms of the CC-BY-SA.